The record-breaking Carlton Complex Fire — the largest wildfire in Washington state history — had burned 250,806 acres, or about 392 square miles, as of Tuesday (July 29). 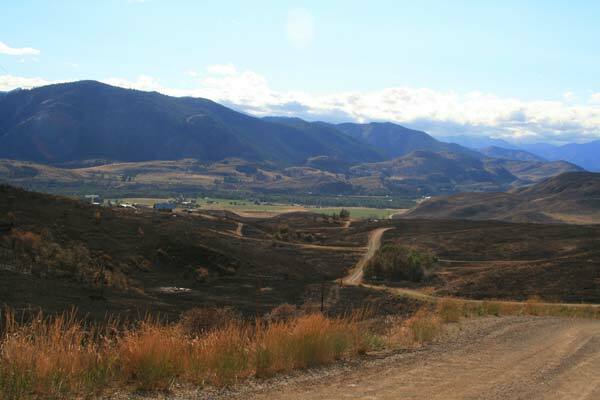 Almost half of that total acreage — 123,159 acres — was consumed in a nine-hour period on July 17, when a wind-whipped firestorm raged south through the Methow Valley — devouring an average of 3.8 acres a second, based on a fire progression map provided by the Incident Management Team. The Carlton Complex Fire, now in its third week, is slowly being contained but hot weather and low humidity means the massive wildfire is still very much alive and fire potential is still extreme. On Tuesday afternoon, fire breached a containment line around Gold Creek and was moving up Foggy Dew Ridge, said Alan Hoffmeister, a public information officer for the fire Incident Management Team. 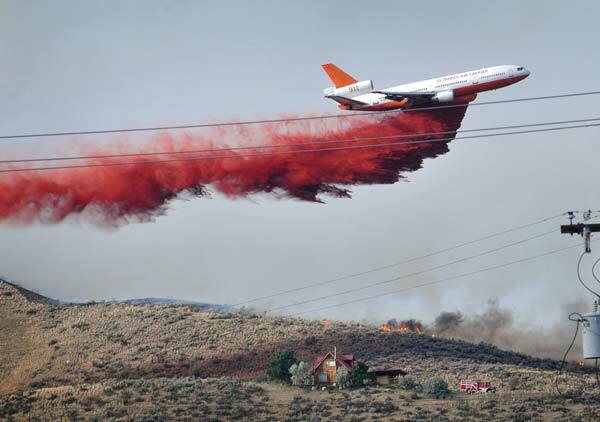 Fire retardant was being dropped by aircraft to try to slow the fire’s advance and prevent it from cresting the ridge. Life was returning to some semblance of normalcy for many Methow Valley residents as electricity, phone and Internet services were restored last weekend to homes and businesses. But life was far from normal, and unlikely to be so for a long time, for hundreds of residents who lost homes in the firestorm that ravaged the southern part of the valley. At latest count, 231 homes were lost to fire in the Methow Valley, Pateros and the Okanogan Valley, and 352 individual parcels of land were burned in the wildfire. Hundreds of residents in the southern part of the Methow Valley are still living with the anxiety of seeing flames on nearby ridges and the presence of fire crews on their property. Areas that were heavily damaged by fire or difficult for repair crews to access are still without power, and some residents will have to wait weeks before it is restored, utility officials say. More than 3,085 people were involved in the Carlton Complex firefighting effort this week, and the fire is estimated to have cost more than $32 million so far, according to public information officials at fire headquarters at Liberty Bell High School. The fire, which is divided into three zones for management purposes, was about 67 percent contained on Tuesday, 15 days after it was ignited by lightning. 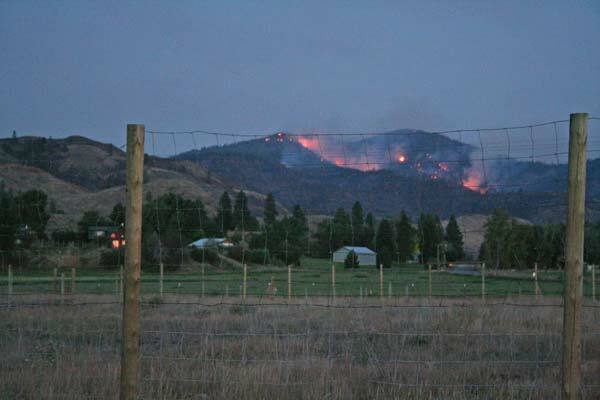 The zone encompassing the Methow Valley, called the Carlton Zone, was about 55 percent contained. The fire started after thunderstorms touched off three smaller fires on July 14 near Carlton and another fire at Cougar Flat near Pearrygin Lake. The fire swept down the valley on July 17, destroying homes along the way and engulfing and devastating two square blocks of Pateros. By July 18, the separate fires had merged together into a massive complex, extending from Pearrygin Lake on the north end, down valley to the Columbia River, north toward Okanogan and south toward Chelan. Miraculously, only one fire-related death had been reported as of Tuesday. A Gold Creek man died of an apparent heart attack while defending his home on July 19. Some firefighter injuries have been reported, and many are suffering from heat-related problems, according to fire officials. Temperatures reaching 100 degrees and low humidity have made the fire more active in the Methow Valley this week. Helicopters were dumping water on hot spots around the Pearrygin Lake area, however, none of the activity was a new start or outside the fire perimeter as of Tuesday. A burn-out planned for Tuesday in rugged terrain near the Loup Loup ski area was postponed because weather conditions were not favorable to safely and effectively carry out the planned burn. More than 1,000 people were evacuated at various times since the fire began July 14, but no Level 3 evacuations (meaning leave immediately) were in place this week, said Scott Miller, Okanogan County emergency services manager. National Guardsmen have visited 500 homes throughout the fire area to conduct “wellness checks” on residents, providing information and making sure they are not in need of assistance, said fire information officials. An assessment team, including county officials and specialists from the Incident Management Team, recently completed damage assessment for the area affected by fire. The preliminary estimate of property destroyed by the fire is just over $28 million, Miller said. The losses will be reported as part of the county’s request for federal emergency funds, Miller said. The 231 homes lost in the fire don’t include new construction or houses that were not on county tax rolls, Miller said. An unknown number of other structures, such as barns, garages and sheds, are among the 352 properties damaged by the fire, he said. Fire crews have established strong containment lines around much of the western edge of the Carlton Zone, with the exception of the northwest portion, above Pearrygin Lake. Fire managers are considering a burn-out operation in that area, said Hoffmeister. The goal would be to tie the burn-out into the Tripod Fire area (which burned in 2006) and deprive the fire of new fuels, to prevent the western edge of the fire from moving further west. However, other options are still under consideration and there is still no certain time for that firing operation, according to public information officers. To the southwest, fire crews have worked to establish fire containment lines around the Gold Creek, Libby Creek and McFarland Road areas. However, as the fire that jumped the Gold Creek line demonstrated Tuesday, it was expected to be a few days before the area is fully contained, fire officials said. A lot of work was taking place Tuesday around Leecher Mountain Lookout, said Hoffmeister. The lookout was surrounded by fire, and crews were trying to protect it from burning, he said. Twisp Mayor Soo Ing-Moody said Tuesday that Gov. Jay Inslee has scheduled a visit on Friday (Aug. 1) to the Methow Valley and surrounding areas devastated by fire. A new Incident Management Team from the Rocky Mountain Area was expected to replace the current Washington-based team that has been directing firefighting operations for two weeks. 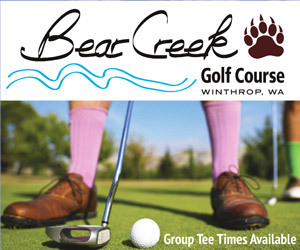 The transition was expected to take place Wednesday (July 30), Hoffmeister said.